The following has been published in full with permission from Nate Checketts. Four weeks ago was without question the scariest night of my life. It has taken me that long to revisit in detail that night and the events that followed it. I have made several attempts, facing down the blinking cursor but unable to get through the memories without fear and worry filling me again and leaving me in a state of panic. But as I have reflected on the experience again and again, it has been clear to me that it is meant to be shared. Not because I have any desire to draw attention to us as a family, but because I have felt prompted to do so and because I have seen the impact that sharing it can have on those who hear it. Whether Will’s story strengthens your faith in a loving God, helps you believe that miracles still exist, reminds you that life can be fragile, or simply showcases the goodness of people, my hope is it uplifts you in some way. Ideally, it does all the above. At around 5:30 p.m. on February 4, I was at work wrapping up a stressful day of meetings. 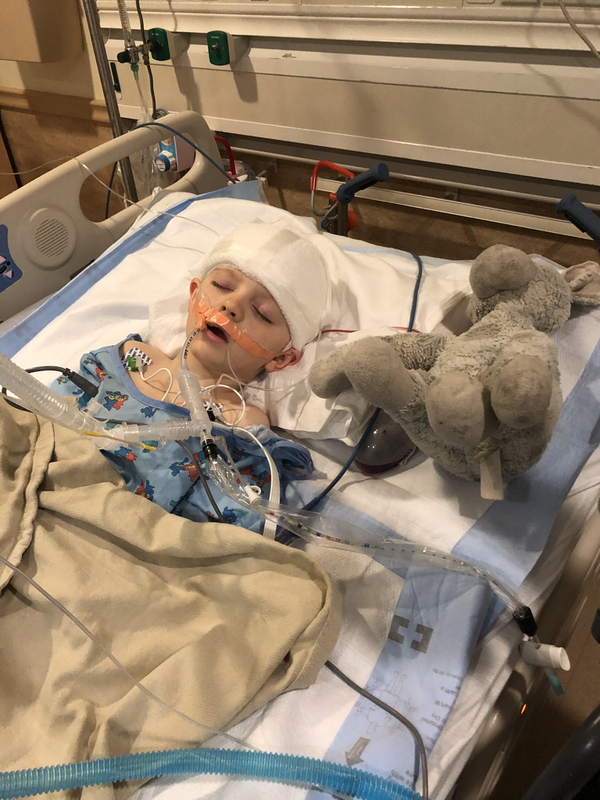 Dayna, my wife, called to tell me that our 7-year-old son, Will, had been playing with his younger brother and had hit his head on a piece of furniture. She said he was upset, in pain, and not calming down. She also said he had only a small goose egg and no cut. I was finishing up something, and I told Dayna to let me know if it got more serious. Thirty or so minutes later, Dayna called me back and Will was saying he needed to go to the doctor, and while on the phone together he started to vomit. As someone who has experienced two concussions of my own and an uncle who died of head trauma, I went into immediate panic mode. I sprinted out of the office and jumped into my car, still on the phone with her. I told her to call our brother-in-law Ryan, who is an incredible anesthesiologist. He told her to get Will to the emergency room right away. I suggested that Dayna meet me at the hospital for speed, but our front gate was malfunctioning and she couldn’t get it open. As she relayed this to me by phone, I drove like a madman breaking nearly every law of the road—and practically burned out my clutch in the process—rushing home to pick Will up. As I raced, my heart pounded and I kept praying that I would not come to regret that I hadn’t left work sooner. Looking back now, it was clearly such a foolish decision to stay, but at the time of the initial call, it didn’t feel nearly so serious. As I drove, I could scarcely keep my thoughts straight. Will and I had always had such a special relationship. He had always been my “daddy’s boy” who wanted to do everything together; he always looked to me for comfort in times of pain. The thought of him being seriously injured or facing dangerous head trauma was too much to process. I thought of my Uncle Larry who passed from head trauma when I was just 3 or 4 years old. He had four children and a wonderful wife at the time of his passing. Such tragedies happen and alter family history forever. I drove more and more aggressively to get to Will. When I arrived at the house, Dayna met me outside with Will. My worst fears started to be validated, as I knew immediately it was serious. He was losing consciousness. I told Dayna she needed to come with me — I wasn’t completely sure if it was panic or inspiration, but I knew I needed her for this. We left our oldest to watch our youngest and called my sister Katie; she lives around the corner and rushed over to be with them. The last coherent thought from Will as we got him into the car was he asked for me to stay in the back with him and have his mom drive. We live almost equidistant from two hospitals. As we pulled out of our driveway, the moment of left or right came, and I felt a strong prompting to go to the Stamford Hospital. I had no idea why, but Dayna agreed immediately and we headed out — driving much more calmly with our precious cargo and more level headed operator. As Dayna drove, Will continued to vomit into a bowl that Dayna had carried out with them. Dayna and I are members of The Church of Jesus Christ of Latter-day Saints, and in our faith, when people are sick or injured we give them a blessing, which oftentimes includes an anointing—a small drop of oil on top of an individual’s head. In my backpack, I always carry a vial of oil that I received from an olive orchard in Rome where I lived 15 years ago. As I gently administered this oil and put my hands atop Will’s head to pray over him, I was shaking, almost uncontrollably. I remember few of the words I said, but I remember feeling and saying to him, “This experience will be a defining point in your life, a witness of God’s love and a source of strength and faith for those who hear it.” The last few words felt out of place at that moment, but looking back on it, it’s one of the reasons I feel strongly that I need to share this experience. I approached the nurses and adamantly but calmly asked that they move faster. After another two or three agonizing minutes of no action, I walked straight into the back area where the real emergency room is and said, “My son needs a CT scan now! Please move faster.” This got everyone’s attention, but the on-call doctor practically rolled her eyes at me—the entire ER was tired of me at that point, as was Dayna, who was a bit embarrassed I was so vocal. They finally brought him back and started to take his vitals. Then Ryan called back to check in and ask if Will had his scan yet, which he hadn’t. He calmly continued to encourage me to push for it and push for it immediately. I went back again to the Doctor and now more forcefully asked for the scan. I was told that she couldn’t physically remove someone else from the machine just to prioritize my son. I told her in a situation as serious as this—she could absolutely do exactly that. Five minutes later, they got him into the CT scan. Will was now almost completely out of it, and one of his pupils was fully dilated compared to the other (which I later learned is called a “blown pupil” and is a clear sign of a serious brain injury). When we got back into his ER room after the CT scan, I poked my head out the door and saw the on-call doctor looking at a brain scan and speaking into the phone in hushed tones. Nurses began filing in and starting to take action with a resident ER doctor directing. Now my worst fears were really being manifested as almost instantly our room was turned into a trauma room. I couldn’t breathe. Dayna was staying by Will’s side as he now lay completely unconscious and extremely pale. The fear was in her face as well. I went and embraced her quickly and rushed out to ask for more information. Nate Checketts at Will's bedside while waiting for a CT scan. You know when you can see bad news on someone else’s face and that expression tells you everything you need to know? That’s how I felt when I saw this 20-something resident coming over to explain that Will had suffered a skull fracture and his brain was bleeding. Though young, she was sincere and detailed—you could tell that she was living out the “bad news” experiences she had likely only previously studied or witnessed as a third party but she handled it like an absolute pro. She explained that the bleeding was severe “about the size of an adult male’s fist” and he needed emergency neurosurgery to relieve the pressure from his brain. She said they were preparing a helicopter and Will would need immediate transport to Yale New Haven Hospital (typically a 45-minute drive). I was distraught. I could do nothing for him as I watched the nurses prepare him for transport. Other patients and family members in the ER were starting to poke their heads out to stare as we paced in agony. I quickly phoned my parents, who are living in London serving as mission presidents for our church. After several rings they picked up, despite it now being 2 a.m. their time. It was my dad’s brother, Larry who passed away from the head trauma while assisting our family in a move. The head trauma took his life as the doctors had been unable to fully control the brain bleed. I knew that this was immediately on my dad’s mind as I tried to get the words out. He and my mom were nearly speechless, but they said that they were on their knees praying and they would ask their 250 missionaries to do the same. We hung up, and I rushed back into the room. Nurses continued to hover and conduct setup for vitals. 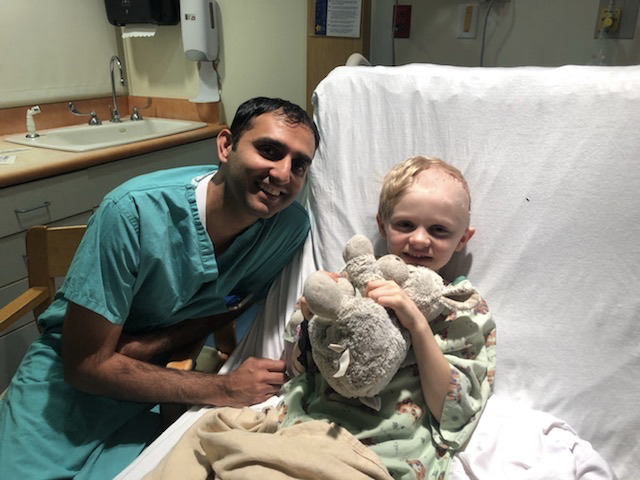 Then the on-call doctor came in and told us that there had been a change of plans: a pediatric neurosurgeon was now on his way to Stamford and would arrive soon—we were going to have the operation here where we were. What we didn’t know at the time was that the resident doctor who had been so attentive had proactively reached out on her own to a friend of hers who knew a pediatric neurosurgeon nearby. She basically decided to bend HIPAA compliance, and I will be forever grateful. As we waited for Dr. Mohan, my other brother-in-law Carras came rushing in, panic in his face. He gave both of us a big hug and asked if we wanted to give Will another blessing. By now Will was prepared and we were simply waiting. He looked lifeless. In fact, someone had notified the on-call priest, who came into our room and felt like an omen of death. I asked the priest if he wouldn’t mind waiting outside as the room was already quite full. Carras and I then laid our hands on Will’s head, and Carras gave him a blessing. The blessing was powerful and direct. 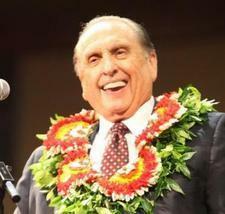 He blessed Will that he would make a full recovery according to our collective faith. 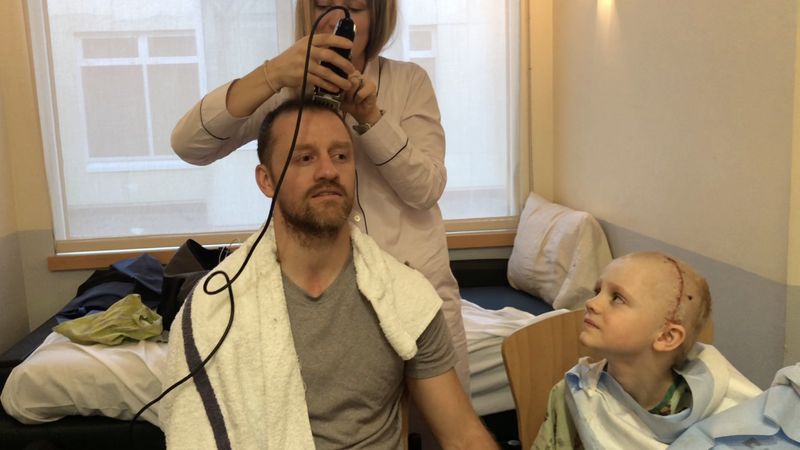 He also blessed him that he would be able to run and jump and play again and that he would spend time with Charlie again soon (Carras’s 8-year-old son). I was now a bit of a wreck. Adrenaline and fear were coursing through me as they never have in my entire life. I was a mess of jitters. I remember I kept putting my hands on my head and pacing as a way to remind myself to keep breathing. At that moment our local ecclesiastical leader showed up—he had been contacted by my parents. He came in and instantly gave us all a hug. His presence was so greatly appreciated. Dayna, of course, was so strong—a rock through it all. A team arrived and rolled Will out on his bed towards surgery as we looked on helplessly. A nurse came to collect all of us and take us to the surgery waiting area. The waiting area was on the second floor of a now very dimly lit hospital. Our bishop, Carras, Dayna, and I were strangely alone on this floor. There was little light other than from a few nearby hallways and a few TVs that showed the latest episode in hospital drama TV. After finding a spot to sit, the three of them sat, but I just paced around some more. I went and purchased four water bottles from the vending machine just to keep my hands and body moving. I was still shaking. I handed one each to Carras, Dayna, and Bishop Doying. I then went and found a corner with a chair and knelt down and poured out my heart to the heavens. I prayed that Will’s life would be spared, that any good deed I had ever done would merit his protection, and that Heavenly Father would keep him here. As this man spoke, the Spirit filled me—I was overcome. I knew I was in the presence of angelic ministering. It was the first time all night that I felt any peace at all. I felt a strong impression that Will would be taken care of—that the Lord was mindful of him and that our prayers were being answered. Every line of this prayer spoke to me. We had not told this man how serious the surgery was, how it was life or death, and how death was a gripping fear that had overcome me as were the feelings of guilt and blame for not having acted sooner. I had not shared any of that. I had not previously prayed vocally, so he could not have known the inner workings of my head. 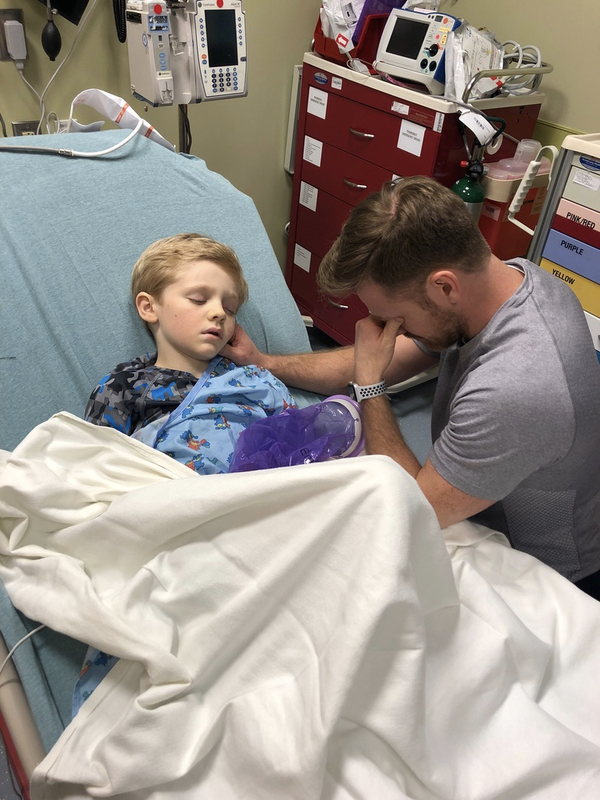 Nate receiving a blessing from Bishop Doying and Barry McMullin while waiting for the doctor to come out of Will's surgery. Oh, the relief. I can’t express it. I was flooded with emotion. I jumped off the ground. After our initial reaction, she went on to explain that the surgery went well and that Dr. Mohan had done an excellent job. He was able to relieve the pressure on Will's brain, and it had drained and was decompressing. She said that there was a lot of bleeding and it was very scary, but that they were very, very encouraged by the outcome. She said the doctor would be out to see us soon with more details, but she wanted to let us know. She was so sweet, and just before turning to go, she said, “Dr. Mohan saved your boy’s life tonight.” We cheered; we embraced. Shortly after, more friends arrived in the waiting area. And my sister Katie came rushing in, holding Will’s favorite stuffed animal—Giraffey, which he has had since he was a baby. She had called a friend to come to take her place at our house so she could be with us. She and I embraced in a powerful hug. It caught me a bit off guard—I hadn’t fully appreciated what it would mean to have her there with me. Words cannot express the bond that is shared—that unspoken bond. She held me and I held her, and we drew strength from each other. 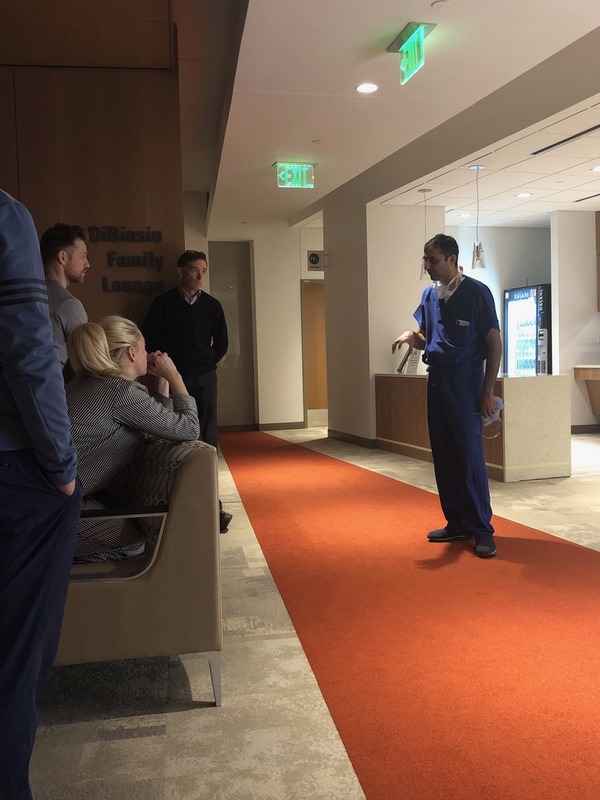 Dr. Mohan explaining immediately after Will's surgery what had happened. 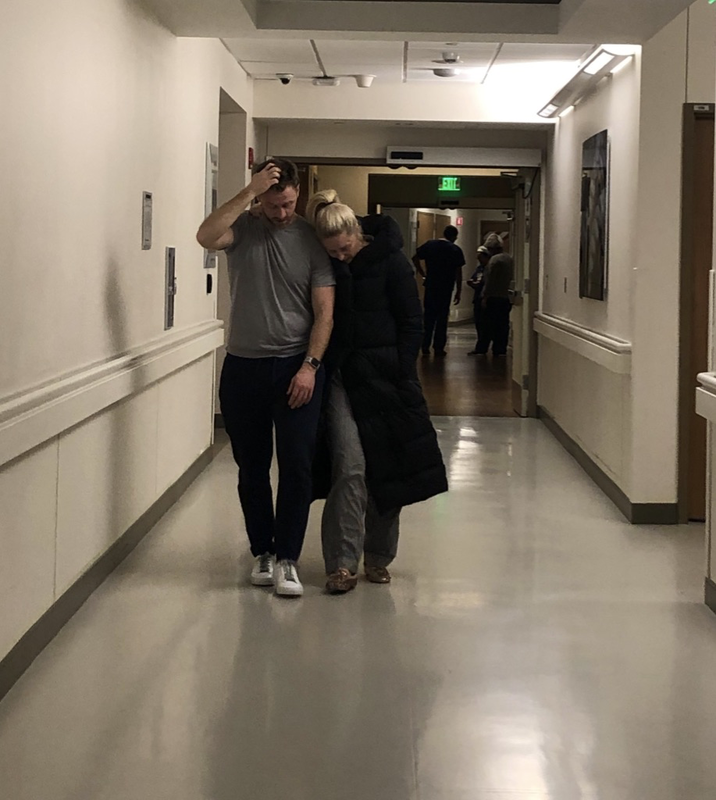 Katie and Nate walking back after Will left in the ambulance to head to the Pediatric Intensive Care Unit in Westchester. 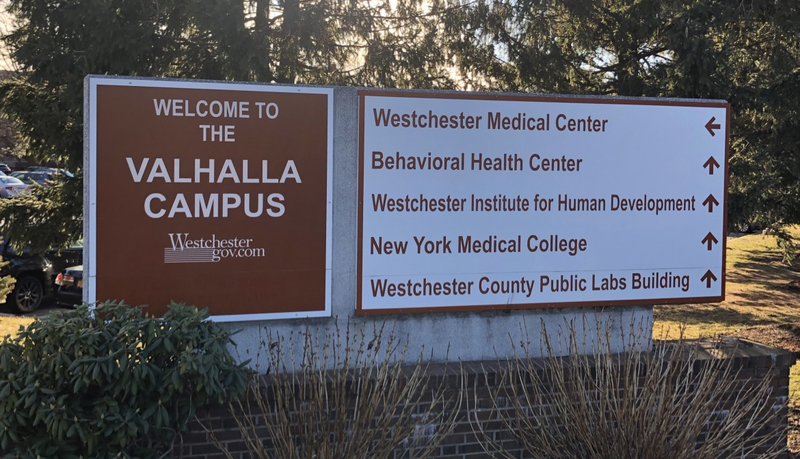 He also said that the transfer was being prepared to bring him to the Westchester Hospital instead of Yale because there was a pediatric intensive care unit standing by to receive him and that Westchester was also his (Dr. Mohan’s) main hospital. He told us that we were lucky the way things worked out. Had Will been life-flighted by helicopter, there’s a chance that too much time would have passed to save him. We were overcome and reminded of both the words of my blessing to Will and Clinton’s prayer—that this moment, this experience would stand as a witness and testimony to God’s power and the power of the priesthood. There was no question God was with us. Will intubated with Giraffey before he awoke for the first time. 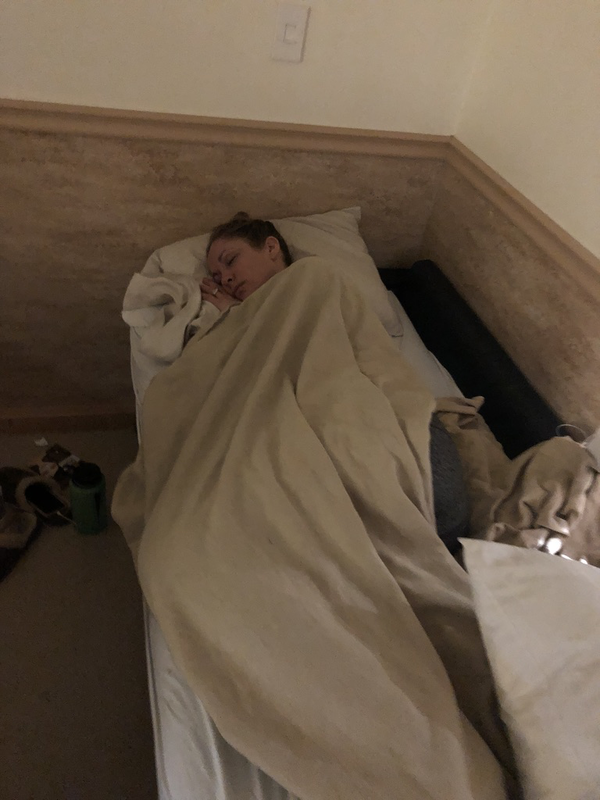 Dayna, who never left Will's side, asleep in a makeshift bed. We spent the next four days in a pediatric care unit in Valhalla, New York, where Will was closely monitored by incredible staff. He had additional moments of vomiting and scare as he recovered from the surgery over those days. He had four different IVs hooked to him and countless monitoring devices. But through it all we had many residents and doctors remark at how incredible his progress was, how lucky we were, and that Will would come back stronger than ever. The post-op CT scan and rapid MRI showed that the bleeding had stopped completely and there was no sign of a brain contusion. The Checketts also learned while in the PICU that Dr. Mohan was the last resident of a Dr. Couldwell, who, after training Dr. Mohan, moved out to the University of Utah around 2001. Dr. Couldwell is the same surgeon who saved my older brother Spencer’s life from a rare and difficult tumor in 2003. Somewhere along the way, my dad started referring to Will as William the Lionheart and it was a nickname that stuck. As I started referencing it on social media, we received many incredible Lion gifts. Too many to name here but we were so grateful for the generosity and acts of kindness. They really lifted our and Will’s spirits in recovery. Nate getting his head shaved to help Will feel better about having a shaved head. Now, just four weeks later, I sit here back in our home, Will and I with shaved heads and he with a scar that will last a lifetime, playing yet another game of Monopoly Jr.—and I simply marvel. I marvel at the divine and miraculous recovery we have experienced, the overwhelming kindness that was shown by so many, and the feeling of love and comfort that a loving God, good friends and kind strangers can provide. Over the last four weeks, I have thought about the many good people in the world who do not get their miracle. The people who have great faith, who also have tremendous support networks and do all they can for the preservation of a loved one but the cure doesn’t come. I do not pretend to know why some lives are spared and others are not. But this I do know—the miracles we experienced were not simply the full recovery Will is making or the doctor’s skill and timing—though both are certainly miraculous. Many of the miracles we felt and received were in the form of comfort from good people just showing they cared. I think of the intake nurse who told us she was a mother and knew how painful to watch your child suffer. I think of the surgical resident who took a risk to contact another surgeon she had never met. I think of Dr. Mohan running from his home to get to the hospital faster. I think of Heather Nelson, Katie’s friend who dropped everything to watch our kids she barely knew. 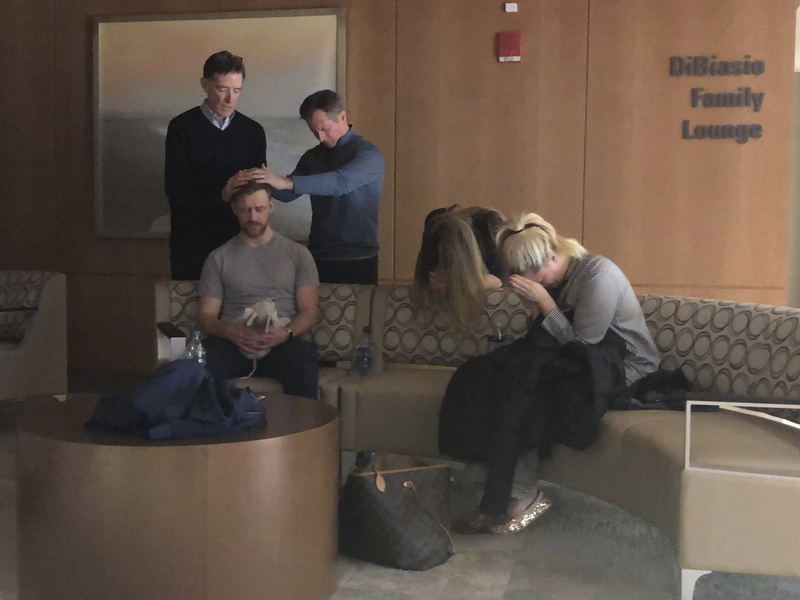 I think of Clinton and his powerful prayer and of Carras who showed up with the right words at the right time, I think of Ryan pushing for us to get the CT scan faster and his wife, Lindsay, who booked a flight to watch our kids so we could be at the hospital with Will. I think of Bishop Doying, the McMullins, Alli Miles and Kelly Brown who came to the hospital. I think of my sister Katie who made countless meals, cried with me and came to the hospital several times to visit. I think of my nephew Teddy who made the most adorable videos and was the first person to make Will laugh post-op. I think of my brother Andrew and his family who made a video to make Will feel better about wearing a beanie. I think of my parents and my in-laws both abroad serving missions to help others, on their knees for hours and wishing they were there in person with us. I think of my work colleagues who made a giant card for Will upon returning home. The list goes on and on. As you can see many of the miracles we received were not just the recovery. It became this crescendo of prayers, texts, emails, social media messages. The power of collective faith and prayer is as tangible as any physical hug. I say unto you nay, miracles have not ceased especially in communities where people care for each other. Let us be good to each other.